At times of great tribulation and turmoil, the first casualty is always the truth. Why? Because the greatest weapon in the hands of the oppressors and tyrants is their ability to manipulate the facts to suit their agenda. Because without the truth, we cannot see what is right and what is wrong. Without the truth, there is only falsehood… and injustice. And that is how we find ourselves where we are in Egypt today, where the elected President of a nation – who was kidnapped and held incommunicado for months till his supporters could be imprisoned, crushed, tortured, killed and banned – stands trial for crimes that seem to multiply by the day. Depending on which side of the divide you fall, President Mursi is either a principled hero of epic proportions or a bungling nefarious criminal mastermind. 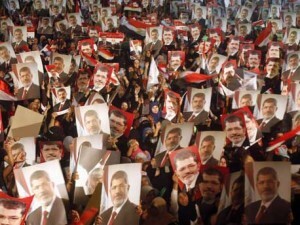 So who is the real President Mursi? One of the little known facts about the president is that he has memorised the entire Qur? ?n by heart. This is no mean feat and something that itself is worthy of praise. The Prophet said: “The best among you (Muslims) are those who learn the Qur? ?n and teach it.” Abu Musa Al Asharee reported that the Prophet said, “Part of showing glory to All?h is to show respect to a white-haired Muslim, and a carrier of the Qur? ?n who does not exaggerate in it nor ignore it and a just ruler.” An interesting combination of virtues there don’t you think? It is widely assumed that Mursi is not that bright. He is repeatedly portrayed as bumbling and dimwitted. His detractors point to a series of decisions that seemed to exacerbate anger against him – such as the taxation U-turns, the choice of governor for Luxor and his battle royale against the judiciary. And yet the majority evidence points to Mursi being much more academically gifted than any of his detractors. He has a PHD, is a professor and was the head of the Department of Engineering in Zagazig University. He has previously worked on various projects in America and was a visiting professor there. In his short time in office, he managed to achieve a fair amount and surrounded himself with individuals with proven track records in their fields. The Egyptian president has many palaces dotted around Cairo. They are sprawling in size and lavishly furnished. When Mursi walked into the Presidential palace for the first time, he had made up his mind that he would not live in any of them. He relented to carry out official government business in these vast palaces, but he would continue to live an apartment rented out for some time. This was how we were treated to the unbelievable sight of the President of a nation having death threats to his family being graffitied onto the walls of the elevator he used to get to his flat. Compare this to the other Muslim “leaders” who (and this is not an exaggeration) have toilets that are bigger than this President’s home. Whilst Mursi was president, his sister fell seriously ill. When he went to visit her in hospital, the doctors told him that she may get better treatment if she was transferred to Europe or America. All they needed was the order from him and a medivac chopper and airplane would be commandeered. He refused stating that his family should not be favored above those of order Egyptians merely because of the position he held. His sister passed away in a government hospital like any other Egyptian citizen. When Mursi was delivering an important speech he was suddenly made aware that prayer time fell. Instead of ignoring the adh?n and continuing his speech or even just staying silent for a minute – Mursi loudly and proudly repeated the adh?n. The effect was electrifying and a generation of pious young Muslims saw that even their leaders submitted to the words of All?h. The video above is of a homeless woman who used to sleep on the streets of Cairo. One day a car pulled up and Mursi himself got out of the back. He asked her why she slept on the streets. She told him that since she had become a widow, she was unable to continue paying for their apartment and eventually found herself on the street. Mursi said that no mother in Egypt should suffer like this and directed officials to provide her with a respectable apartment and enough of a stipend from the state to pay for it. Since the coup she has become homeless again. This is a picture of President Mursi visiting Banda Aceh, Indonesia following the devastating South Asian Tsunami that killed hundreds of thousands of people. He was there as part of an aid mission to help the survivors rebuild their shattered lives. Mursi isn’t just another scheming member of the deep state of Egypt who has done nothing but worked for their own advancement and that of their families since day one. When Bashaar Al-Assad sent him a congratulatory message on his election to the Presidency, Mursi replied “I do not recognize you as the rightful representative of the Syrian people.” Despite all protocols, he could not bring himself to be polite to the murderer of so many innocent people. We get so used to seeing the sickening figures that business moguls, sports stars and so-called celebrities pull in that we expect our political leaders to be earning mega bucks as well. We’re not shocked when we see former Prime Ministers or Presidents become millionaires on the lucrative speakers circuit. Mursi could have taken the opportunity of being President to build a nest-egg for himself and his family. After all, he still lived in a rented flat. Maybe he could buy himself a house? It turns out that President Mursi was the lowest paid world leader. Read that again. In. The. World. He stipulated that his salary would be $10,000 for the entire year. At the time of his kidnapping, it transpired that he had actually not actually drawn any salary at all. He had been working for free. President Mursi was so keen not to miss any prayers in congregation and in the mosque that it became a running joke amongst the coup supporters who felt such outward displays of piety were pretentious. Yet, ignoring their cynicism, Mursi did not miss his prayers and he was often seen moved to tears by the khutba on Friday prayers. Egypt, like most Arab dictatorships, had the picture of their “benevolent” leader plastered across the walls of every building. You couldn’t go anywhere in Egypt without seeing Mubarak staring down at you. When Mursi was elected, he decreed that his picture should not be hung in any Government buildings and replaced the portraits of his predecessor with that of the name of All?h. This policy has been reversed and many Egyptians are once again deifying their overlord. The truth is the first casualty of war. And I accept that the truth is much more complex than these 10 points. There have been mistakes – Mursi admitted as much. But, whether you love or hate him, I hope some of these facts will help you gain a better understanding of the man behind the figure of love and hate. I hope they can help point you in the direction of the truth.